This Tibbit is a front end for Tibbit #26 (IR command processor). The Tibbit contains Vishay TSMP6000 infrared photo detector and TSAL6100 infrared emitter. 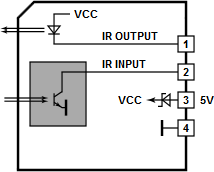 Some useful information on these parts and the required setup on the Tibbit #26 side can be found in the Examples of Wiring to IR Receivers and Emitters topic.